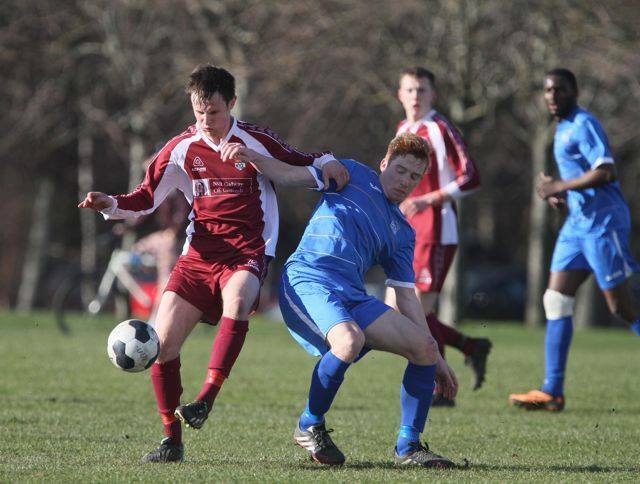 DCU’s Collingwood Cup challenge is over for another year after they fell at the semi-final hurdle this afternoon against NUI Galway, losing 2-0. Goals right on the stroke of half-time and then in the final seconds were enough to see the Westerners into the final. Although DCU were dominant in the second half and pushed hard for an equaliser they were thwarted by a very physical NUIG defence as well as a deteriorated pitch that had seen a lot of football over the last three days. Without midfielder Shane Madigan due to an ankle injury picked up in yesterday’s quarter-final win over UUJ, manager Declan Roche brought in the recently returned from injury Michael Isichei to play up front, moving Michael Cogley into the centre of midfield alongside Darren Craven and pushing Daniel Mahon and Dean Cregan out to the wings. The game looked an even one up until Galway broke the deadlock with DCU perhaps shading it in terms of chances. The best of these came from Isichei in the 18th minute when, capitalising on a defensive error, he tried to take the ball around the goalkeeper but the Galway man stayed tall and gathered the ball. In both of DCU’s Collingwood matches before today a notable positive had been the solid centre-back partnership of Robbie Gaul and Tom Lahiff. Therefore it was a big blow to the Glasnevin side today when captain Gaul had to be withdrawn after 27 minutes with a shoulder injury. Towards the end of the first half NUIG were beginning to threaten Ben Dale’s goal and came close when first a header was saved by the feet of Dale and then a last ditch tackle from DCU full-back Philip Kavanagh denied a certain goal. The Galway side were beginning to get on top of the game as half-time approached and eventually broke the deadlock right on the break. A free kick from the halfway line was launched into the box causing problems for the DCU defence as they failed to clear, eventually allowing Mikey Creane to dive in at the back post and head into the net. The goal however seemed to have an effect on DCU as they came out for the second half. The Dubliners dominated possession throughout the second period but just couldn’t find the telling ball. On 58 minutes Craven’s cross from the left found the feet of Mahon who turned his defender beautifully but lacked composure with the finish, firing over. Ten minutes later another excellent ball into the box from Craven, this time a free-kick, wasn’t dealt with by the Galway defence allowing Conor Ralph to shoot at goal, but only straight at the ‘keeper. The introduction of striker David Lodola with twenty minutes to go saw a more direct approach from DCU as they searched for an equaliser. However the move didn’t really pay off as nothing was getting over the heads of the strong Galway defence. As the clock ticked into injury time DCU pushed higher and higher up the pitch looking for the equaliser. However, this only allowed Galway’s Shane O’Rourke to latch onto a crossfield pass in the 94th minute and calmly slot the ball by Dale into the bottom corner to send the Westerners into the final. The loss was a hard one for DCU to take after going out in the same round last year and, as is always the case with university football; a rebuilding process must now begin to replace the players that will leave the college at the end of the year.